You are here: Home / Guest Blogging - Is This What It Takes to Be Successful Online? / The Dangerous Myth About Guest Blogging You Likely Believe. The Dangerous Myth About Guest Blogging You Likely Believe. There’s this popular misconception that IF you’re Guest Posting for an A-List blog, THEN your blog will blow up. Before your guest blog goes live, you’ve preemptively increased your hosting, lest all these new salivating visitors crash your website because they’ve been starved and they’re hungry to devour your awesomeness . The inner circle of blogging elite are all firing emails off through their secret network saying “You’ve Got To See This? !”, while simultaneously arguing, and making power plays vying for who’s going to book you to write next. Smaller blogs in your field simmer with Awe and Envy because you achieved what they never could. Which of course, never happens. In fact, none of it happens. It’s weird though, your guest post got more comments than all others in recent history. Heck the publisher was even kind enough to let people know YOU were when they sent traffic to your Twitter account. Part of the problem comes from how we think about in the first place. We think that popular blogs are at the center of big conversations and that by , we’re going to siphon off some of that fame. But before you start thinking it’s that easy, first you must realize that blogger has done (and is doing) more than their fair share of promoting their blog to be at the center of that conversation. It’s never as simple as just being a good writer. Second, remember their readers are their readers. Just because your post went over well on that site, doesn’t necessarily mean they’re interested in checking you out. I’ll explain a little more why I think that is in just a minute, but first I want to show you a personal example. Back in October of 2011 I wrote a guest blog for Chris Brogan.com titled 106 Excuses That Prevent You From Ever Becoming Great. By all accounts, this post was a success. Within the first few hours it received 64 comments and 1011 social shares. Chris would later inform me that over 38,000 visitors had visited the post within first 48 hours of it being live. Here’s what the traffic on my site looked like the day it went live. Wait, wut? Only 330 visitors? 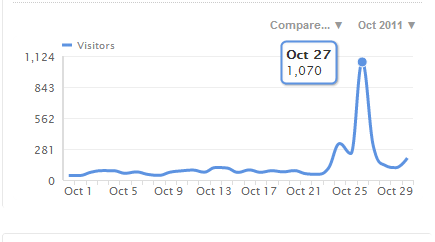 Granted, this was better than the 105 visitors that came the day before, but that hardly seems like the type of traffic that should come off a post that received that sort of viral attention. Now, that next major spike is a little difficult to ignore, and from that comes the real secret. Chris dedicated a post to me. In this post, he commended the 106 article and briefly discussed why he published it. At the end, he gave a direct link recommending that readers check out my site. The whole thing was pretty brief, maybe 200 words. But those words were such a powerful recommendation that well over 1,000 decided to visit my site that day. Not nearly the same spread, but a ton more referral traffic. The truth is, people go to ChrisBrogan.com (or any other popular website for that matter) to read that author, or at least authors who write in the style of the blog. We don’t read these blogs to “discover” new authors. The reason there was so much more traffic from Chris’s post was because it essentially said it was ok to check me out. On a popular blog, reader’s know what to expect. But on your site? Not so much. They don’t know if coming to your site is will be a waste of time or what. Which is why it’s so powerful when that popular blogger links out to you. Now when your article is mind-blowingly awesome, there will always be a percentage of people that click through your byline link to learn about you. But that’s what it takes; MIND BLOWING CONTENT. I’ve posted for several large blogs now, and I can say with all sincerity there have been posts that yielded no noticeable lift in traffic. But when I spend between 15-20 hours researching an audience, there’s always a decent little bump from byline clicks. If you were to compare to the technology curve of adoption those brave souls who click your byline would be the “innovators,” they’re brave enough to check you out without any sort of extra referral. The “early adopters” are the people only pay attention after you’ve gotten a contextual link, or even better a webinar with an influential person. They’re great, and this is the group you should really be fighting to reach. The “early majority” are the people who begin paying attention only after you’ve been and doing joint work with several bloggers on a steady basis. And to round out the metaphor, your “late majority” are the ones who discover you via word of mouth, and the “laggards” are the ones that buy your book from a secondhand store because they happened to like the title. Unfortunately, so many bloggers give up and consider themselves a failure when they reach “The Chasm” because they’re under the misconception that byline clicks are going to make them famous. Think about like your favorite long running TV show. On Tv an actor might guest star for one or two episodes, but over the course of 100 or 200 episodes, one or two performances won’t make a huge difference. Furthermore, if that guest star only views their role as a way to move the plot forward, they’re all but forgettable by the show’s finale. This is not the case for all guest stars though. In fact, some guests give such a stellar performance, the fans DEMAND they become a mainstay of the show. For example, the character of Chloe O’Brian from my favorite series “24” was originally scheduled for 4 episodes. However fans liked what Mary Lynn Rajskub did with the character so much, she had the second most appearances on the show, beat out only by the show’s star, Kiefer Sutherland. Of course, these two actors are the exception, not the rule. With , you should absolutely try your hardest to write something where people demand you come back. But if that doesn’t happen, the next best thing you can do after your post has gone live is to leverage the experience for repeat post opportunities, and expand your network. Every popular blogger started at zero. Most of them will be willing to help, but only if you’re hungry and WILLING to realize success doesn’t happen overnight. In other words, don’t make your efforts about “getting famous”, but rather to simply be invited back. I share all of this with you in hopes of giving you a realistic perspective of what is really about. It alone is not what gets you widespread love and recognition. It’s the introduction; To the audience, to the blogger and to you taking your content seriously. If a post does well, offer a follow up webinar, or a Google+ Hangout On Air. Anything you do that takes the information deeper is what’s going to endear an audience to you. Guest blogging isn’t the end, it’s the beginning. It’s only when you realize this about that it becomes a truly incredible weapon. The internet needs more driven creators that will not rest until their genius becomes fully realized. If you demand quality, and you’re willing to do everything it takes, this will help. In this game, it’s more about savvy and perseverance than it is raw talent. So, are you willing to give it a go? Hi Tommy! Happy New Year! Do you accept guest posts on your blog here? I have in the past, but don’t on a regular basis. My criteria for guest posts here is that you’re able to write about something I can not. I’m willing to hear all pitches, but I warn you, I’m very critical. Shoot me a pitch at tommyisastrategist @ gmail.com and we’ll go from there. First let me thank you for writing this article. You made 2 great points. 1) When you write, always ask, “what kind of response are you inviting?” I believe your advice to ask guest-bloggers to start writing to be re-invited is a great one. After all, the host blog’s audience barely knows you. Your guest post is parallel to a first meeting experience. By striving to be re-invited by the host blogger, you’re giving yourself a chance to form deeper relationships with your host’s audience. 2) You brought us back to think about our audience/customers. Good writers know who their audience/customers are. But great writers know how their audience/customers behave. Thank you for being transparent with your blog traffic data too. May I boldly ask what is the kind of ad revenue you were receiving with 100+ visits a day? I would love to take credit for your point #1, but if I’m being honest, that was the major takeaway from Jon Morrow’s Guest Blogging course. This was how I was able to get the guest posts I’ve gotten in the first place, and the mindset has come after taking the work behind it a lot more seriously. And it’s always about the customers and how they behave. I firmly believe in there being 4 types of content in a marketing plan and when you know how to work that content, you can really discover how people will behave with it, and the products you endorse. Thank you for boldly asking about the ad revenue :-P The truth is, none. With this blog I’ve never entered into the ad revenue/pageview economy, so that’s not how this blog has been used. Instead, I’ve used it as a tool to demonstrate my knowledge and close consulting contracts. In that economy 100+ visitors a day has been enough to support my family comfortably. Thanks for sharing this Tommy. I’m setting out on my first guest posting expedition in Jan so this is timely for me. I like the idea of diving deeper when you strike a chord. Take the webinar example: would you do this 100% on your own and hope the blog host would be willing to promote it? Specifically I’m interested in how you continue the conversation with an audience at another blog :). I forget where I found you, but I’m glad I did! Since then (maybe a couple of months?) when your emails come through, I always save them and read them when I have time. :-) I’m glad you enjoyed it and I hope it can make your day a little better. I’m going to be doing more in this series so I hope it can help you make the most of your guest posting opportunities. Nope, I was totally looking at your computer screen when I wrote this. I’m glad that you’re using guest blogging, and it’s even better that you’ve been invited back. Do everything you can to establish an awesome relationship with that publisher. 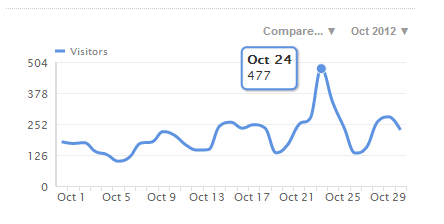 I didn’t share the image in the post, but a similar spike in traffic happened when I got a link from problogger mentioning a new technique I was using in my writing. Bear in mind, I’ve been writing period guest posts for Problogger for almost two years now, but that was a very nice thing when that happened. Also, I don’t converse with Darren quite so much because I’m kind of a weenie about approaching new people. Great post. I’m getting ready to go out with a guest posting campaign and while I see the value of getting the big sites (like Brogan) was wondering if you could share some thoughts on the returns from smaller niche sites as well? I have a few popular sites I’m going to try and land posts on but right now I see the bulk of my strategy focused on “smaller” – still a “big guess” on my part so I’d love some perspective. My experience with smaller sites is that they generally have a more dedicated following. Even though there isn’t as much reach, there’s a lot more dedication, and that goes a loooong way. It takes longer to get a wider reach, but I believe it’s time very well spent. With all of this it’s a matter of consistency more than anything. When you look at that adoption rate graph above, MOST people I know fall into that chasm because they don’t push hard enough for anything beyond the guest post. There’s no follow up to do videos, webinars, or ANYTHING, and that kills any chance of building momentum because you’re always starting from scratch. There’s two videos I’d like you to watch. This one which works great as an outline for guest posts that you want to sell something. And this one by Danny Iny that talks about engaging at smaller levels. Hi Tommy, thanks for sharing your experiences. I’d like to clarify, you mean a-list bloggers in your niche, right? For example, my 6 figure blog is a transport blog that gets 3,000 visitors a month. Blogging on the likes of Problogger, Copyblogger and Chris Brogan is worthless to me. However, if I blogged on Road Transport, then not only would the audience appreciate what I have to share, but they can relate to me. I’m sure what I’ve learned is of interest to the right audience, but my content and generic A-list blogs are not a match made in heaven. What I’m really talking about is click through rates. From the people I’ve talked about with this, many believe that there’s going to be a ton of byline clicks that will make their blog popular instantly. Like you’re saying, people will appreciate what you’re writing if you’re writing for another Transport blog, and some of those people are going to click over. BUT if you do more to create an ongoing relationship with that other blog, every post you do with them will solidify that your stuff will be more worth looking at. Every niche has an A-list, so no, posting with the people I mentioned here would probably be pretty worthless to you. And I don’t know because I’m unfamiliar with the transport community, but I imagine based on conversations I’ve had with other people in other spaces, the outcome of massive amounts of people coming over and becoming super credible right away is still the same.